Farrow & Ball paints founder Tom Helme put some gloss into the prize presentation at Southend Highland Games. Natalie Sharp who won the ladies 100, 220 and 440 yards as well as the half mile was a worthy winner of the ladies Carskiey trophy, presented to the event by Mr Helme and named after the house he rescued from ruin. Men’s 100 yards winner Kevin McIntyre also won the Carskiey cup. Mr Helme, accompanied by his partner Lisa Ephson, presented all the prizes at last Saturday’s games and was amazed as prolific field winner Paul Dearie, from Carluke in South Lanarkshire, collected six awards as well as the open cup. Mile, half mile, 220 and 440 yards winner Matthew Turner from Tangy won the Kevin Scally Mile cup. 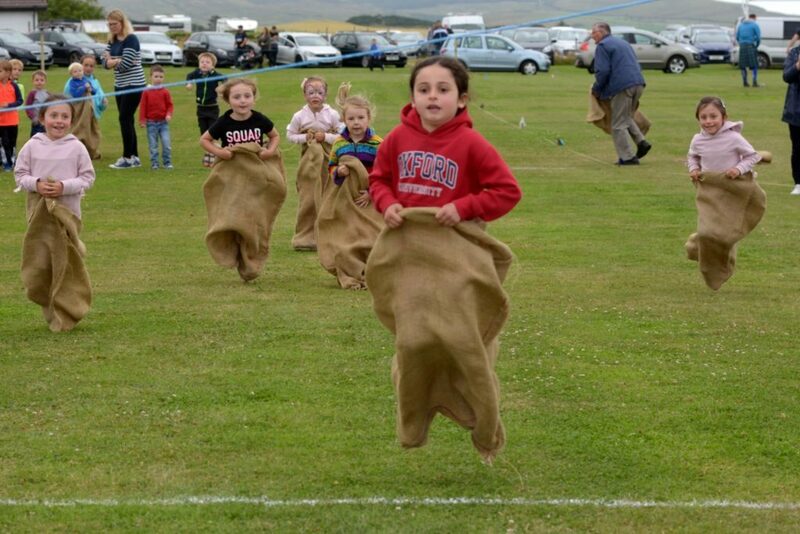 In the less formal events sacks must have fitted much better this year as few competitors seemed to be running in the sacks. There were many large leaps and a few tumbles. The committee of Southend Highland Games thanked all sponsors and individuals who helped in 2018 including: D. McNair & Son, Campbeltown Motor company, McFadyen’s Transport, AJC Civils, McFadyen’s Contractors, Muneroy Stores, Jim Martin Supplies, James Barbour, P McKerral & Co, Kintyre Vermin & Pest Control, Hamilton Brothers, CSWind, Jim McPhee, Wally’s Mega Store, Glenside Tractors, R.A.F.A., Westwards Vets, McKinlay/Kidd, Argyll Bakers, John Ralston, Wright Ogilvie, James Wilson, Bill and Linda Brannigan, Gillian Docherty, Davidson’s Animal Feeds, Lorna Hamilton, Willie MacMillan and Dunaverty Golf Club. For more Southend Highland Games news see pages five, 32 and 33.